Kauai was one of the most special and memorable trips I've been on this year. As soon as we stepped off of the plane, I knew it wasn't going to be anything short of magic. While I love being able to build up excitement for a trip, it's always nice to just book a ticket and go somewhere last minute - which is exactly what we did here, so we didn't have many expectations. The only way I can describe Kauai is - a jungle paradise, and an extremely magical one at that! We decided to rent a car so we could do maximum exploring and hopped into a fun little Jeep at Lihue airport. This is a great way to look like a tourist but driving around in that thing felt like my ultimate Beach Barbie dream come true. 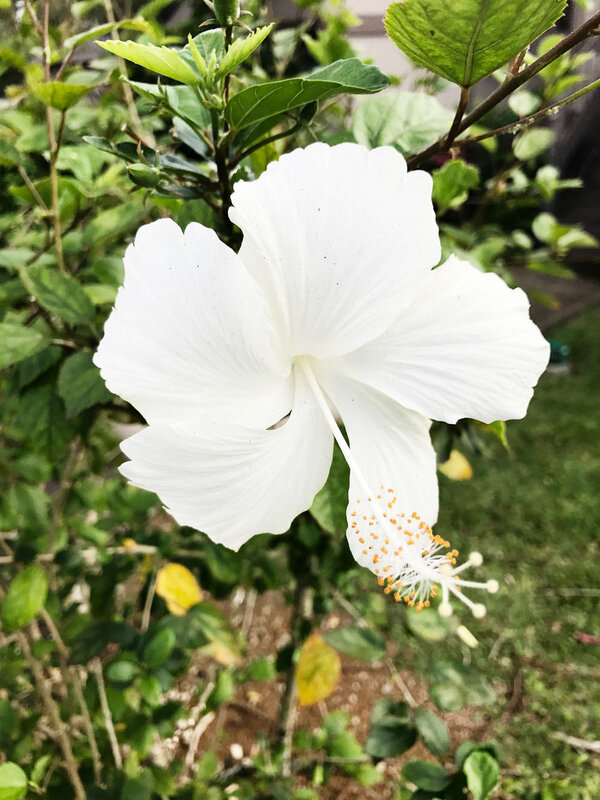 With the abundance of life, it's clear that it rains a LOT on Kauai. I believe it is, in fact, one of the rainiest places on earth! But by some incredible stroke of luck, we didn't experience a droplet of rain the entire time we were there. We did, however, experience something far more bizarre. Vog, as the locals were calling it, is a phenomenon where a volcanic ash cloud hangs over Kauai if there is an eruption on the Big Island. The Vog hovered over the island for two days. It was thick and ashy but made for some mind blowing sunsets - in that sense I didn't really mind it! I've known Hawaii, in general, to have a reputation for having an aggressive surf scene. If you know anyone that surfs, I'm sure they have a story or two. Kauai, on the other hand, had the most surprisingly welcoming and friendly vibe. I have to be honest that if I were Hawaiian, I'd probably really hate people flying in on jumbo jets and stealing my waves (and developing my pristine island) but here, people are just mellow, friendly, and very helpful towards travelers. It probably helps that Z is actually a pretty good surfer and the most friendly guy, but I could really sense the Aloha spirit was strong here and we even made a few friends. At the top of my travel notes I had written in bold - people are SO nice here! We spent the majority of our days doing one of three things - hanging on the beach and surfing, eating poke bowls, or exploring. My favorite exploration was driving to the very end of the North side of the island and hiking the famous Kalalau Trail. It was wet and muddy and a bit crowded but the views were breathtaking and the lushness of the jungle made us feel like we were in a movie. I took several photos that almost look fake as I look back at them now. It might be terribly obvious to say, but the beaches in Kauai are spectacular. The water glows with the most inviting spectrum of blues and I felt like swimming for hours. While some beaches have lagoon-like tranquility, others have raging surf pounding the shoreline. The best part is, if you don't like one beach, there are twenty more within a 30 minute radius. I really enjoyed peacefully floating around while Zack took a more adventurous approach further out in the breakers. I had every intention of taking a beautiful shot of one of the countless poke bowls we ate while on our trip. Unfortunately, they were just too good to wait and we took each one down with feverish intention. Another food favorite was shaved ice topped with fresh liliquoi, and we had one almost every day of our weeklong adventure. You can never understand how truly incredible the liliquoi fruit is until you visit Hawaii - perfectly balanced between tart and sweet, it just melts in your mouth. Another fun adventure, yet decidedly too much driving, was visiting what they call, "The Grand Canyon of the Pacific." I've never been to the Grand Canyon but I can assume from the name that it's quite similar. I wish we had given ourselves a bit more time there to hike and get off the beaten path but the vistas were absolutely beautiful nonetheless. The Vog was just starting to lift as we arrived and we could see for miles and miles. POKE BOWLS AT THE DOLPHIN!!! Adventuring to the other side of the island to see the "Grand Canyon of the Pacific"